It does appear that someone is preparing humanity at large for a mass "de-population". The generations to be born towards the end of this decade, or the beginning of the next, should by all means endeavor to preserve their inner child for as long as possible. For the childhood dream of changing reality through a tap of the magic wand, wielded by a playful magus, could soon, in words of Google Lab’s CEO Ray Kurzweil, become “feasible activity in full-immersion virtual reality.” In so saying, Kurzweil actually has in mind a particular magician, the popular sorcerer Harry Potter from J.K. Rowling’s bestsellers. For those acquainted with Kurzweil’s labors, there is nothing unusual in him relying on a fictional character, whose personal traits seem to closer resemble those of the IT geek, like a young Bill Gates, than a classical wizard from our fairy tales. Moreover, Ray’s pop-science book Singularity is Near and Rowling’s postmodern occultism perfectly complement each other on the market, not least because they target the same demographic: people on the threshold of adolescence. If we allow Harry and Ray to enlighten us, we are also obliged to repress the fact that their stories are fiction, not because reality refutes them, but because its logic burdens them with implications which, at least for an adult, shatter the “immersion.” Magic is an activity of producing effects while sidelining their visible connection to causes. As such it is particularly attractive to children and younger adolescents, not only because it promises the possibility of performing the impossible, but even more so because it implicitly renders obsolete any responsibility for an act. Meanwhile, the virtual world prophesied by Ray functions according to astonishingly similar rules: the rift between word and speaker, deed and consequence, widens and deepens inasmuch the virtual avatar is perfected, i.e. removed from reality. The power of creativity grows proportionally to diminishing responsibility. 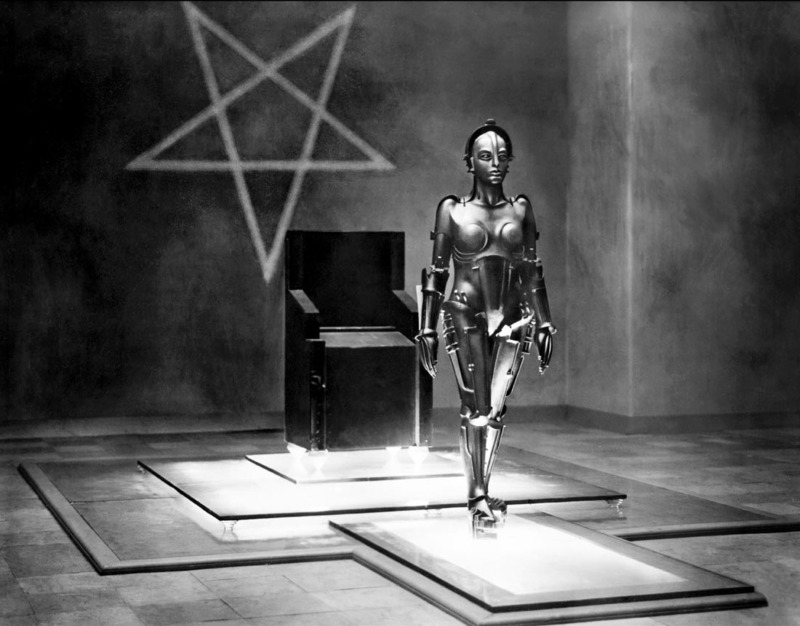 Technology in the service of sorcery: Fritz Lange’s 1927 Metropolis. Biological automatons gathered under the aegis of a transhumanist, or in a more final version, posthumanist movement would more or less unequivocally answer in the affirmative. For those unaware, Ray Kurzweil is merely the most media-savvy face among many others: an inventor, entrepreneur and futurologist whose job seems to be marketing the process of braving the political, economic and epistemological peak of the age of transition. It is an all-encompassing social project whose feasible and intermediate aim is our death.